Bake My Day! : Bread Baking Babes rock the boat: Adjaruli Khachapuri! Bread Baking Babes rock the boat: Adjaruli Khachapuri! This month was a very nice one to ease us into our ninth year (can you believe that??). This January our Kitchen of the Month resided with Aparna and she baked us Adjaruli Khachapuri in her Diverse Kitchen! Don't shy away from that intricate name thinking that this is an intricate bread to bake. None of that. It is easy but so much fun to bake and a true showboat on your dinner table. My boys send me happy smiles when they saw what I was making: "that for dinner tonight Mom? Great". Acharuli/ Adjaruli Khachapuri is a boat shaped bread from Georgia, that has melted salty cheese and a soft cooked egg or sometimes two in the middle hollow part of the “boat”. The name Khachapuri has its origins in the words “Khacho ” meaning cottage cheese / cheese curd” and “Puri” meaning bread. I believe the Georgians often eat this very popular bread as a snack or for lunch. Some people like to call the Acharuli Khachapuri a Georgian Pizza Pie, but I think that’s insulting both the Pizza and the Khachapuri. There are similarities but they’re really two distinctly individual dishes to my mind. Khachapuri is considered one of Georgia’s national dishes and each region of Georgia apparently makes its own variety of it. So much so that the Tbilisi State University supposedly developed a “Khachapuri Index” to measure inflation based on how much it costs to make one Imeretian Khachapuri! Put all the ingredients for the dough into the mixing bowl of the standmixerl and knead together until everything comes together into a smooth and somewhat loose elastic dough that’s just short of sticky. Transfer the ball of dough to a well-oiled bowl, turning it so it is coated all over. Loosely cover and let it rise till double in volume – about 1 to 1 1/2 hours. Place a pizza stone, or a baking sheet on a rack in lower third of oven. Combine the cheeses in a bowl and set aside. 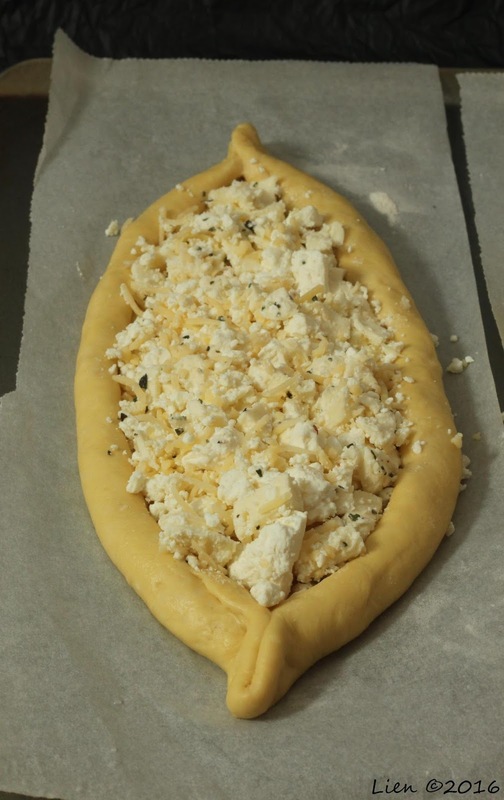 Deflate the dough and divide it into two halves. Working with one piece at a time, roll it out to a rectangle about 25 cm long and 3 mm thick on a piece of lightly floured parchment. This makes it easier to transfer the dough to your baking sheet. Roll the long sides in a bit curving them inwards at the ends and seal well (with a little water) or the edges will open up during baking. Then bring the edges close and pinch together on both ends to form a “boat” like shape. Again, make sure the ends are sealed well. Transfer the “boats” to the baking sheet, but if you’re going to bake them directly on the pizza stone just omit this step. Fill the centre “well” area with half of the cheese mixture so it is a little higher than the edges of the dough “boat”. Repeat with the other half of dough and bake them for about 12 to 15 minutes until the Khachapuri are golden brown. Take the breads out of the oven and add the sliced tomatoes and return them to the oven. Bake for another 3 to 4 minutes. Take the Adjaruli Khachapuri out, and serve them hot. It helps to wait for about 10 minutes before eating them so you don’t burn your mouth! The Khachapuri in this post is known as Acharuli/ Adjaruli Khachapuri as it comes from Adjara (Achara), the mountain region of Georgia's Black Sea coast which is known for its dairy products. In Georgia, this bread is often filled with a cheese called “Sulguni” which is a salty sheep’s milk cheese or Imeretian cheese, or a blend of both. Mine are still a bit naked, I baked them and will reheat with egg and tomato tonight for dinner! Can't wait.. Though the Bread Baking Babes (BBB) is a closed group, you can still bake with us as a Bread Baking Buddy every month and here’s how it works. Aparna is your host this month. Bake this Acharuli/ Adjaruli Khachapuri according to the above recipe and post it on your blog before the 28th of this month. Please make sure you mention the Bread Baking Babes and link to this BBB post in your own blog post. Then e-mail Aparna at aparna[AT]mydiversekitchen[DOT]com with your name, a 500px wide image of your bread and the link to your BBB post. She will then send you a BBB badge for this bread that you can then add to your post on your blog. At the end of the month Aparna will make a beautiful round up mentioning all our Buddies!! Your cheese mixture looks fantastic - and I love the sturdiness of your boats. Beautiful! Your crust is so gorgeous! They were easy, weren't they? And sooo tasty! They are really easy to reheat and enjoy the following day, curious to find out if you liked it with egg too. I hope you're aware that I changed that recipe above to how I baked it myself.... it's not entirely the one that Aparna used. Show Boat! they really are. and leave it to you to put the label on correctly. These are show boats but they are also just fun and so good to eat. I know Lien I calculated the weight and came so close to yours so that's what I ended up with. Didn't use egg in the dough and added some more olive oil. Look at the oven spring you got! They look like wooden shoes rather than boats (but not hard like shoes would be - more like wonderful slippers) . They're wonderful! I love the idea of having more bread than cheese. Even though I still have a horror of runny eggs, I'm so glad you tried the version with egg. And of course, everyone is welcome to stay at our house. But be forewarned. 50% of the inhabitants think that runny eggs are the bees' knees. Hmm maybe he will take his chances here then. He willingly ate a stuffed bell pepper yesterday night. And you are right... they do look very sturdy my boats.